I love pasta. I realize this makes me incredibly unique in this crazy world of ours, but I feel comfortable declaring my love openly. I hope I can trust you with my secret. Unfortunately for me, after being diagnosed as being diabetic a few years back, the carbohydrates in pasta do not like me. Could I fit those little devils into my diet if I wanted to? Sure. But given the choice between a plate of pasta and a small (ahem! Just go with it. My doctor may read this) dessert, the sweets will win every time. That said, I do miss the pasta from time to time. The other day I was dithering at the counter at CousCous, my new favorite Mediterranean restaurant and, thinking out loud, said I’d love to have the chicken marsala, with its tasty sauteed mushrooms and beautiful, silky sauce, but that I couldn’t do that many carbs. The owner, twinkle in his eye, said “We could do it on zucchini noodles,” and may have changed my life. I got my order and it was delicious. 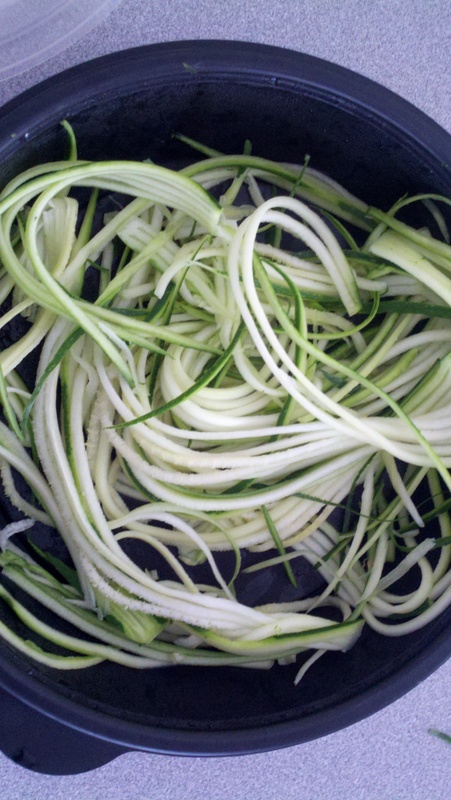 Instead of spaghetti, he’d julienned zucchini into long strips almost identical in size to the usual noodles. The slightly denser zucchini added a nice extra bit of extra chew to the dish, but otherwise altered the flavor barely at all. It’s been my Friday night meal for the last month straight. After last week, I decided that it was time to start finding a way to bring this easy menu alteration home. I eventually settled on the Kuhn Rikon Julienne Peeler and found that my nearby kitchen wares vendor, Spoons ‘n Spice, had one available. By the way, if you’re looking for helpful suggestions for kitchen gadgets, the ladies at Spoons ‘n Spice were not only helpful, but free with the candy in the hopes of quelling a potential tantrum from my little one. Their services are highly recommended. The cutter is a dream to work with. 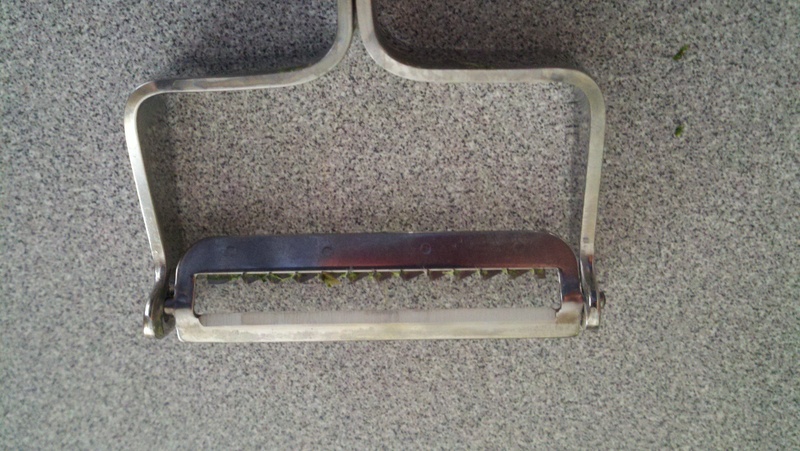 Similar to a Y-peeler, it slices of a thin sliver of vegetation and then, by means of a number of vertical blades, slices it into the julienne. The veg is so thin at the end, about the size of angel hair pasta, that there’s no real need to cook it since it is plenty tender raw, but the application of any hot sauce will cook it pretty much instantaneously. Some childhood favorites that were abandoned when carbs became a concern have come roaring back into my diet. So far, my go-to has been a big, heaping plate of deep, dark tomato sauce with lots of seared ground beef for protein. As with actual pasta, though, the options are pretty much endless. 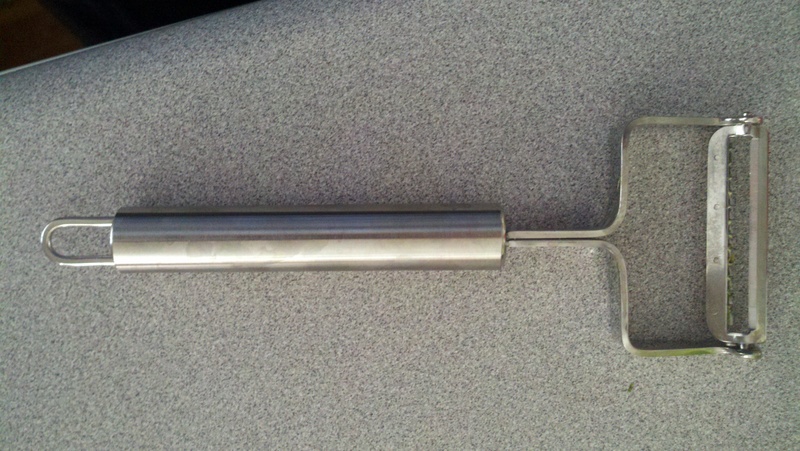 It’s rare that a small kitchen gadget has this much of an impact on one’s food choices, but this one really does represent a seismic shift for me. Pictures below.